Working out if you need dental implants and if you would benefit from the dental implant procedure is of key importance to decide whether you should take your search further. The following list gives a brief overview of the types of problem that dental implants can help with. If your teeth are in such a condition that they have to be removed then it is advisable to think about the ways you are going to replace them from the outset. A good dental implant dentist will remove any failing, unstable or broken teeth in such a way so as to preserve the surrounding bone structure. This preservation allows easier placement of the dental implant which means you end up with a better result in the long run. Prior to having failing, unstable or broken teeth removed we recommend having a consultation with our dental implant dentist in Harley Street to discuss the long-term treatment plan post extraction. Implants can stop your dentures from moving. Lower dentures can often slide around but have the advantage of being held in by gravity. Upper dentures may have more suction but have the disadvantage of dropping down. Dental implants can help with loose dentures in the elderly and young alike and negate the use for denture adhesive to keep loose dentures in place. Not everyone with dentures is suitable for stabilisation with dental implants, the biggest factor is the amount of bone in which to place the dental implant. Over time the bone in your jaw recedes if you have had teeth removed, this means there is less bone in which to anchor the dental implant. 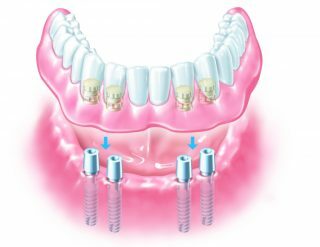 The number of dental implants required to hold in place loose dentures can vary, it’s possible to use only 2 implants if they are strategically placed, however sometimes up to 4 implants are used to hold false teeth in place. When a dental bridge is placed to replace the missing tooth it almost always requires removal of healthy tooth structure either side of the gap, this is to receive the supporting structures for the replacement tooth, known as abutments. Because dental implants do not involve teeth either side, implants do not damage the surrounding teeth. Dental implants also preserve the gum and bone around an extraction site. This is because when a tooth is extracted new bone does not form, rather existing bone collapses into the hole. This collapsing of the bone means there is a loss of bone height in that area, a loss of bone is also linked to a loss of gum tissue. 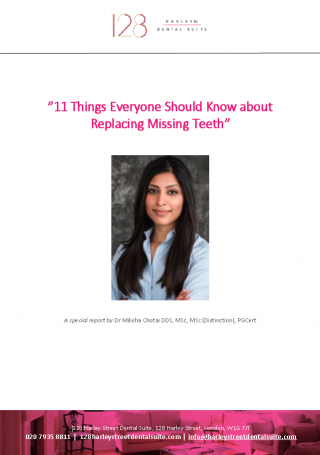 Some people are missing some of their permanent teeth because they have failed to develop, dental implants are certainly one of the options for replacing missing teeth. If permanent teeth have failed to develop in an otherwise healthy mouth then using a dental bridge to replace the missing tooth can be unnecessarily damaging to the surrounding healthy teeth. In this instance a dental implant can be the most preferred option. Why choose our Harley Street dental practice for dental implants? At 128 Harley Street Dental Suite, Dr Stefan Abela and Dr Milisha Chotai will work together with you to treatment plan your dental implant treatment, ensuring you are fully informed of all of your options and co-discovering with you your ideal treatment plan which suits your lifestyle and budget. Further questions about your specific situation?